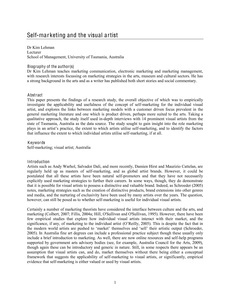 This paper presents the findings of a research study, the overall objective of which was to empirically investigate the applicability and usefulness of the concept of self-marketing for the individual visual artist, and explores the links between marketing models with a customer driven focus prevalent in the general marketing literature and one which is product driven, perhaps more suited to the arts. Taking a qualitative approach, the study itself used in-depth interviews with 14 prominent visual artists from the state of Tasmania, Australia as the data source. The study sought to gain insight into the role marketing plays in an artist's practice, the extent to which artists utilise self-marketing, and to identify the factors that influence the extent to which individual artists utilise self-marketing, if at all.